Is your house now full of soooooooo much candy? Are you looking for something to do with it? Or conversely, did the kids come home with a lot of candy and you are looking for a way to get your hands on it? Either way, this could be the answer to all of your candy woes! Think about it. Tell the kids you are going to put their candy in cookie dough and bake it into a pie. They are sure to give up at least a couple of pieces! Or use up some of the stash you don't want around the house and bring a pie to the office. Butter up the boss a bit and remove some excess stash from your house. No matter what your inspiration is, this will be well received. MiMi also made some candy bar ice cream to go with the pie! Now that really brings it all home! All she did was make a batch of her famous vanilla ice cream and stir in some chopped up candy bars at the end. My sister Chloe is already asking for more next time she comes home! Arrange your pie crust in a pie plate. Prick the bottom a few times with a fork. place pie weights or parchment and dried beans into the pie crust. Bake for 10 minutes. Remove from oven. Remove pie weights and allow to cool for a few minutes. 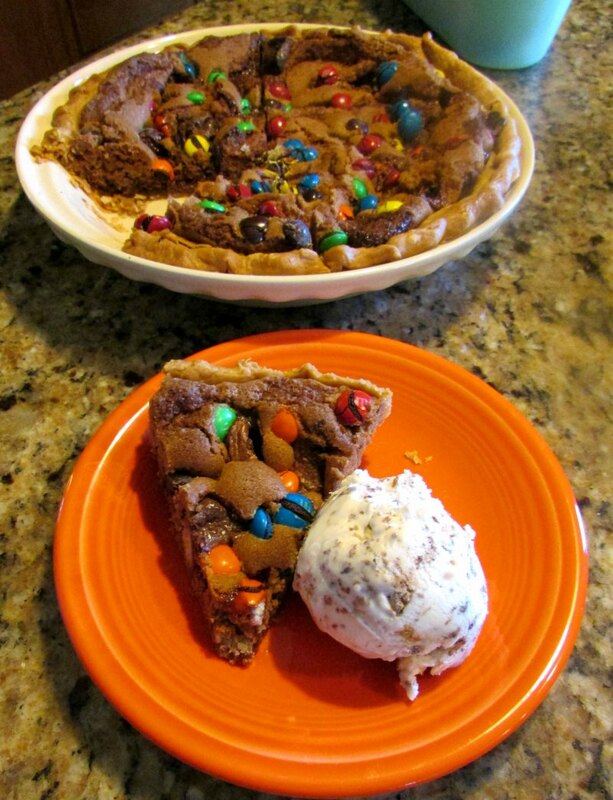 Spread cookie dough over pie crust. Sprinkle candy over top. Place back in oven for 45-50 minutes. Cool slightly before serving. For more delicious pie recipes, click here. I know, right? So easy and really good too! Oh my yes. 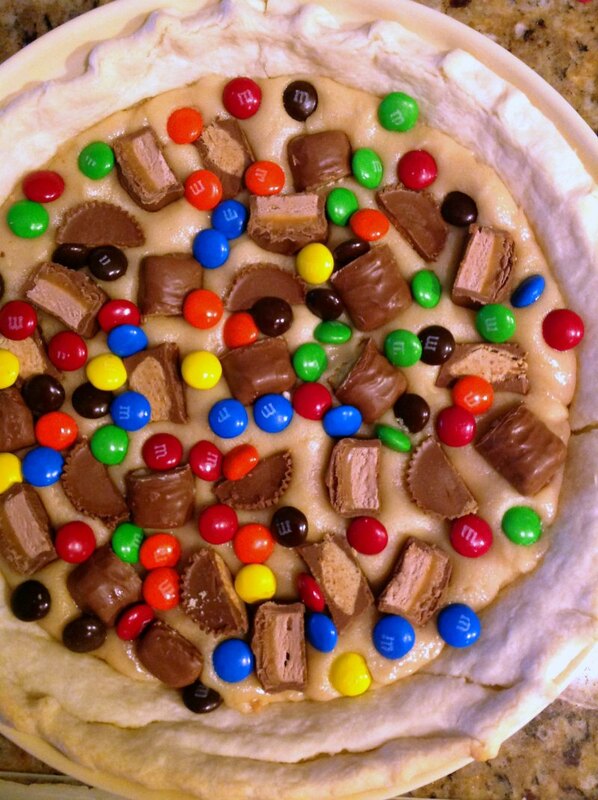 This looks too good Carlee...I need this now. It was sooo good and so easy! 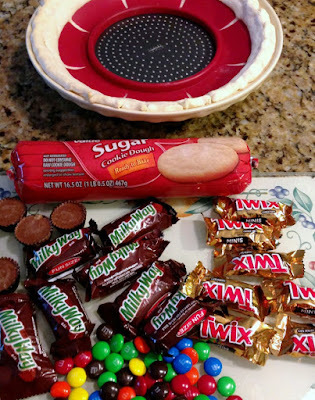 Oh Carlee, I love this idea to make this candy pie with leftovers for Halloween candy! Thanks for sharing this and your other recipes with us at Cooking and Crafting with J & J. It is a great way to repurpose the candy with very little work! Thanks so much for hosting, Julie! This will cure the sweet tooth! Love it! Or make it grow ;-) Thanks! Oh this sounds positively sinful - and I love it! It is and it is worth every calorie! 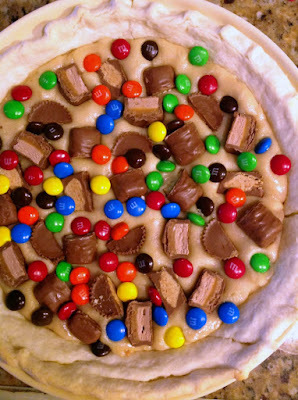 This is definitely my kind of pie- looks amazing! Thanks! It is nice to not have to fuss with measuring sometimes! What a great idea. I'm sure the kids would love making this. Thanks for sharing with the #BlogFair, hope you can visit again this week. I'm sure they would love being able to make a pie all on their own! Thanks so much for hosting! There goes my diet - Thanks for linking up to Pin Worthy Wednesday, I have pinned your post to the Pin Worthy Wednesday Pinterest Board. Tell me about it! I have a feeling this winter is going to be hard on my poor jeans! Talk about easy! I love simple recipes like this to make with my little niece. She's gonna love smooshing all the candy pieces into the cookie dough, I know it!